"I guess you can call this my confession, except I'm not asking for forgiveness." What elements make up an effective gangster film? Is it the graphic violence, rampant profanity and lack of moral conduct? Or do we love the grand themes of honor and betrayal? Countless films have followed the genre�s �rise and fall� structure, going all the way back to 1932�s Scarface and moving forward to classics like The Godfather and Goodfellas. New releases must compete with these signature pictures while also trying to escape the shadow of The Sopranos� epic conflicts. It is difficult to watch a preview for a new gangster film and not compare it immediately to past moments. These stories can still be entertaining, but need that special touch to even come close to matching previous greats. Although the gangster film�s standard plot features are important, the difference between a typical entry and a classic is our total immersion in the environment. We don�t look at Brando and Pacino and consider them actors trying to be gangsters. On the other hand, the primary figures in Brooklyn Rules don�t make us forget about the genre�s history. When we see the always-interesting Alec Baldwin playing the powerful Caesar Manganaro, his performance still feels eerily similar to superior gangster characters. When Manganaro tortures a business rival with a meat slicer, our horror should match that of regular-guy bystander Michael Turner (Freddie Prinze, Jr.). This pivotal sequence uses competent filming and skilled acting from all the players. However, the adherence to genre norms makes it forgettable once you go beyond the graphic violence. Baldwin chews the scenery to great effect, but the shock wears off quickly because we�re not invested in the story. The story follows three childhood friends entering young adulthood in 1980s Brooklyn. Michael strives for a better life while attending classes at Columbia, but can�t seem to play by the rules. Bobby (Jerry Ferrera, Entourage) is excessively cheap and refuses to get involved in any immoral activities. The gangster wannabe of the group is Carmine (Scott Caan)�a tough, fearless guy who catches Caesar�s eye. These aren�t evil, blood-thirsty guys, but they�re far from saintly. Their personalities are very different, but growing up together can bond even the most disparate personalities. Michael and Carmine are constantly ripping into Bobby, which is annoying, but does accurately portray the relationships of many long-time friends. Their friendship is the film�s strongest element, and nearly helps it overcome an often-predictable plot structure. Few promotional taglines generate less excitement for me than the phrase �starring Freddie Prinze, Jr.� After watching him struggle through dull roles in I Know What You Did Last Summer, She�s All That, Wing Commander and many others, his presence in this film was not an attraction. I�m surprised to report that Prinze actually does a good job playing the self-centered, yet well-meaning Michael. There�s nothing astounding about his performance, but he brings a quality weight to the main character. The other actors are generally good, with Jerry Ferrara as a standout. He receives less screen time than some of the others, but brings impressive humanity to the role. Scott Caan has played this type of loutish guy many times, and Mena Suvari offers little personality, but they aren�t a major distraction. It�s hard to complain about Alec Baldwin, who receives top billing on the DVD cover, but his role is less important than expected. 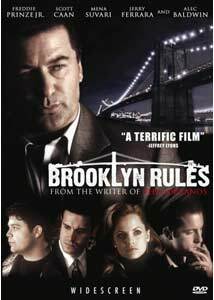 Brooklyn Rules owes much of its relevance to Writer Terrance Winter, who has penned 25 The Sopranos episodes. The screenplay is based on his Brooklyn childhood, and the main characters are based on Winter and his two best friends. Their close bond is believable, which keeps things interesting, even when the guys act like idiots. The more typical gangster moments are less memorable, with one murder even feeling way too similar to a famous scene from The Godfather. Voice-over is also tricky to do well, and Michael�s comments sometimes veer into obvious territory. The choice makes sense because we�re hearing the recollections of an older man, but it still threatens to take you out of the immediate story. Winter�s sharp dialogue and capable direction from Michael Corrente (Outside Providence) keeps the pace moving well. They don�t overdo the final act, and wisely hold the running time to about 90 minutes. This keeps the focus on the small-scale story and helps this movie to move slightly above the pack of standard genre pictures. Image Transfer Review: Brooklyn Rules utilizes a solid 1.85:1 anamorphic widescreen transfer that presents '80s Brooklyn in all its glory. Many scenes take place indoors in areas that have limited opportunities for visual invention, but they still appear clearly. There is minimal grain and the colors shine well from the screen, which leads to an above-average presentation. Audio Transfer Review: This disc offers a 5.1-channel Dolby Digital transfer that presents the fast-moving dialogue clearly. The timely songs, including numbers by the Rolling Stones in the '60s and Dire Straits in the '80s, move well throughout the entire sound field. I wouldn't call the audio "pristine," but it does remain consistent throughout the picture. This release also offers a 2.0-channel Dolby Surround track that delivers an acceptable experience. Extras Review: This release includes an informative commentary from Writer Terence Winter and Director Michael Corrente that offers plenty of good details. It's quickly obvious after a few minutes that Winter is the driving creative force behind this picture, which contains specific characters and events that come directly from his childhood. Both speakers have an easygoing demeanor that helps to create an interesting discussion. The disc also has about six minutes of quick interviews with Winter and the main cast members. Highlights include Alec Baldwin describing young people's attraction to power and Freddie Prinze Jr. recounting his New Mexico childhood. This segment is far too brief and just has time to offer quick details about the production. The only other extra is the theatrical trailer, which appears in 2.35:1 widescreen and spotlights the film's gangster aspects. Brooklyn Rules offers an interesting story that should keep you engaged throughout the fairly brief running time. The acting works fine and the writing feels authentic, but the characters don't jump off the screen enough to deliver a classic picture. Supported by an informative commentary, this release deserves a rental if you're looking for a solid, lesser-known drama.